This month’s cocktail is for my friend Sandy. She shared a really great story recently that I can't stop thinking about. Sandy loves vodka, as does most of her family—including some newly discovered relatives. (I told you there was a great story, and I’ll tell you about in just a moment.) She attributes it to their Russian heritage. By the way, if you’ve ever wondered why Russians drink so much vodka, it’s simple. Vodka is made from potatoes, and there are a LOT of potatoes in Russia. They’re a staple that’s easy to grow and store. And, as we all know now, easy to turn into alcohol. But I digress. Sandy’s favorite vodka is peach vodka, and she drinks it simply: either on the rocks, or with tonic. But she’s looking for other ways to try it. Peach vodka can go well with a lot of things. It’s great in several beachy cocktails. You could do a Madras (vodka plus cranberry and orange juices), Sea Breeze (vodka plus cranberry and grapefruit juices), or Bay Breeze (vodka plus cranberry and pineapple juices) with peach vodka rather than plain. And of course, you could do a peach (Moscow) mule, adding the vodka to a copper mug filled with ginger beer, lime juice, and mint. Yet I wanted something different – something less predictable and a little richer. I didn’t find any recipes that appealed to me so I decided to make something up. Looking in my liquor cabinet, I saw the bottle of Ancho Reyes that I recently bought. Ancho Reyes is a Mexican liqueur made from ancho chile (also known as dried poblano pepper), cinnamon, and cacao. It’s a little spicy. I thought it would make a good counterpoint to the peach in the vodka. After all, there are a lot of tasty salsas out there with peach as an ingredient. And there’s also a hot sauce called Valentina. When I found that out, I took it as a sign. But I didn’t want the kick of the Ancho Reyes to overpower the peach vodka, which is the star of the drink. So I decided on a ratio of two-to-one vodka to Ancho Reyes. 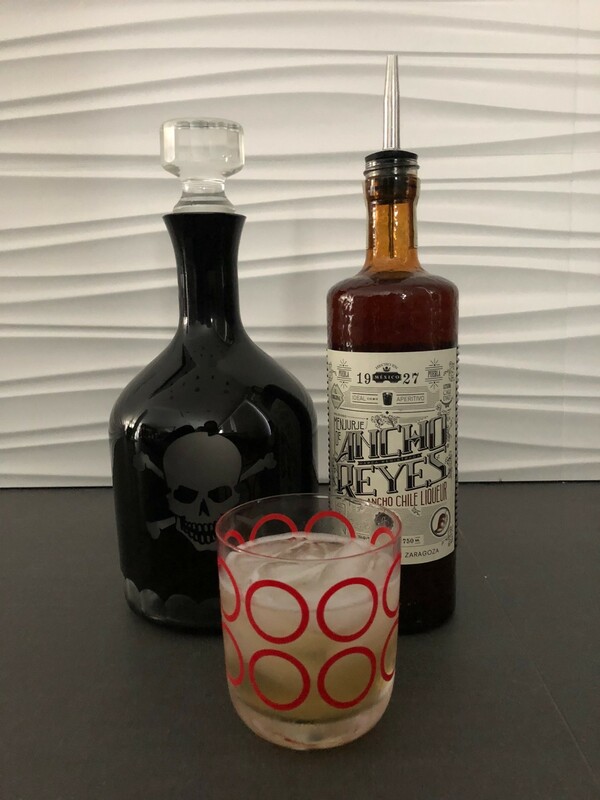 Depending on how much you like spicy drinks, you might want to play with the ratios to have more Ancho Reyes, and less vodka. And if you don’t like peach, you may want to try this cocktail with a different flavored vodka. Just choose something you think would play well with the heat of the pepper. There are no rules here – bartending should be a fun experiment! To smooth out the taste and dilute these intensely-flavored ingredients, I filled the rest of the rocks glass with sour mix. You can make it at home yourself or purchase it. The result is Sandy's Valentina. It’s refreshing but with a little kick to it. It reminds me of a peach margarita, even though they have different base alcohols. For me personally, I would probably use less vodka and more Ancho Reyes next time, because I like spicy drinks. I'd also maybe try using unflavored vodka and peach puree to cut down on added sugar and make a slightly thicker cocktail. Click here to find out what happened when he found her. It’s a bittersweet story. Combine the vodka and Ancho Reyes in a rocks glass over ice. Fill the rest of the glass with sour mix. For added tartness, add a splash of lime juice. Transfer the mixture into a shaker, shake for 5-7 seconds, and pour it all back into your rocks glass. For a garnish - I have to admit I’m low on ingredients at the moment. But if I had an orange, I’d cut off a wheel and use that. Simple. Bottom line: this summery drink is easy to make, and you can do lots of variations on it. I’ll probably play with it again in the future. I hope you enjoy it. Here’s to Valentina.